La Escondida – NMC, Inc. 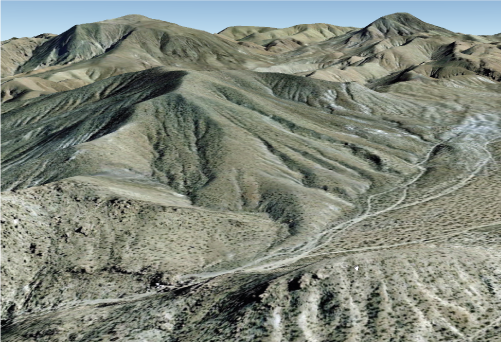 The La Escondida property, located in San Bernardino County, consists of seven contiguous claims located along the mountain front and the valley below. The La Escondida Claim in Daggett California is located in the Ord Mountains which resides in the western Mojave Desert of southeastern California. Consisting of steep-sided canyons, rugged ridges, sandy washes, and alluvial fans. Mineral exploration in the central Mohave Desert region began over a century ago. Occurrences of economic minerals are often located in hydrothermal veins along fault lines. Portions of the site appear to have been mined over the years. Several dug mine adits were noted on claim 1. Additional diggings were evident on several of the other claims. Mining appears to have been by hand methods. Gold originally was discovered in the San Bernardino County area just a few months after Marshall’s famous discovery at Coloma in January of 1848. San Bernardino pioneer Sheldon Stoddard, who was one of the first to locate gold on the Mojave Desert, found several flakes of the mineral along the banks of the Amargosa River at the foot of the Avawatz Mountains. There were some minor mining successes in the Mojave throughout the 1860s, but Indian problems, and the remoteness of the locations, delayed the development of the mines at lvanpah to the end of the decade. The community of Ivanpah, located on the eastern slope of Clark Mountain in the northeast corner of the county, originated with the mines and remained in existence until the end of the century. Success of the lvanpah mines spurred prospectors to look elsewhere in the desert. Their search eventually led them to the Ord Mountains, located 20 miles southwest of Camp Cady and about 16 miles northeast of present-day Lucerne Valley. The central peak of the chain is Ord Mountain, which, at 6,309 feet above mean sea level, is the tallest peak in the south-central part of the Mojave Desert. It is flanked by East Ord Mountain, which rises to 6,068 feet above sea level, and West Ord Mountain, with an elevation of 5,525 feet. While on the northern slope, they also had discovered a mineralized vein which could be traced for several miles. A close examination of the rock revealed particles of gold and a copper-stain. When the site was revisited, it was determined that the location was at the western extremity of the mountain range in Township 7 North, Range I East, seven and one-half miles south of Daggett.